MONTEREY, Calif. -- A Dennis the Menace statue stolen almost a decade ago from Monterey was recovered at a scrap yard more than 2,700 miles away in Orlando, Florida, Monterey city officials announced Friday. The bronze statue was taken from Monterey's Dennis the Menace Playground on Pearl Street the night of Oct. 25, 2006, and arrived at Brothers Scrap Metal in Orlando on Aug. 22 of this year, city officials said. Cartoonist Hank Ketcham, who created the famous comic strip, commissioned animator Wah Ming Chang to sculpt the life-size statue, which was installed at the playground in 1988. Ketcham died in June 2001 in Pebble Beach. Police officers and park crews looked for the statue soon after it disappeared in late October and the city offered a $5,000 reward. The 3-foot-tall and 200 pound statue is valued between $25,000 and $30,000, according to city officials. Monterey police the and Orange County Sheriff's Office in Florida are working together to find out how the statue made it to the other side of the country, city officials said. 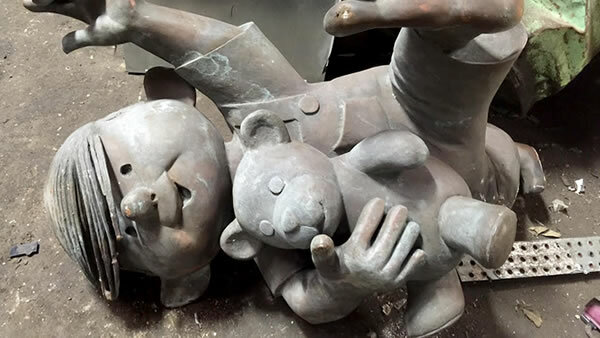 The statue ended up at the Florida scrap yard and was going to be melted with other metal objects, but the owner's daughter-in-law recognized the cartoon figure, according to city officials. Her Internet search turned up news stories and photos of the missing statue, city officials said. They're working to transport the statue back to the Dennis the Menace Playground. City officials said they plan to grant the $5,000 reward and will place the statue back at the playground's entrance. Five months after the statue had disappeared, the city placed a new statue casted from the original statue with the help of Ketcham's family. The replacement statue will be moved once the original returns to Monterey, city officials said.